Please join us on the first Wednesday of each month at St. Monica's. The Faith Committee meets every first Wednesday at 9:00 am, hosted at St. Monica's Catholic Church. For information and the agenda please contact Delis Alejandro at delis@stmonica.net. The Committee addresses issues of poverty, hunger and homelessness as it pertains to faith-based organizations. these organizations have a unique position in the community and provide many volunteers for Coalition events. Some of those events are the annual Homeless Memorial Service and Project Homeless Connect. 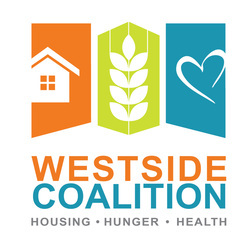 The Coalition offers Faith Communities the opportunity for collaboration with other like-minded organizations-Strength in Numbers, educational and advocacy opportunities as we are recognized as the collective service provider advocacy voice for homeless individuals and families on the Westside. Additionally, public awareness and service coordination are high priorities for the Coalition. Click here and fill out the form to request a Membership Packet if you haven't already joined. Our meetings are the first Wednesday of each month at St. Monica Catholic Community, 725 California, Santa Monica. We start at 9am but have refreshments at 8:30am. On particular nights of the Winter Shelter program the Westside Coalition in conjunction with the Faith Committee sponsors Faith Connect Nights. This annual tradition brings together faith communities and friends throughout the Westside in a collaborative effort to collect needed supplies and distribute them to residents of the Winter Shelter. Each winter as the weather turns cold and it begins to rain, temporary Winter Shelters are set up for the homeless residents on the Westside of Los Angeles. Before the Winter Shelters close, the coalition organizes Project Homeless Connect days in collaboration with the shelter operators. 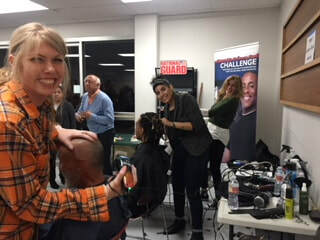 These events brings representatives from the local non-profits and city and county social service agencies to the shelter to provide shelter guest various services including employment, health, mental health, legal, housing and more. The Faith Community, comprised of several different religious organizations that have become members of the Westside Coalition, gather donations to distribute throughout the evening. This year the Faith Connect days were well attended by area congregations and the guests at the shelter were very grateful for all the wonderful items. 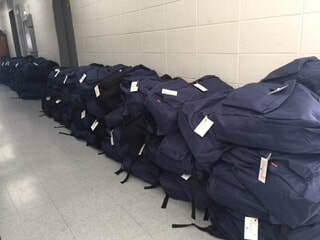 A number of congregations collaborated together to provide Sleeping bags, socks, homemade blankets, t-shirts, cookies, toiletry items to give to the guests of the armory. We also had haircuts courtesy the gals from Paper Scissor Rock Salon in Venice. If you encounter a family in need of homeless services on the weekend or after hours, Call 211. All meetings unless otherwise noted are held at St. Monica Catholic Community at 725 California Avenue, Santa Monica, 90403. Access parking via California Avenue. All are invited to Planning Committee meetings to help plan future activities. Agency presentations involve a presentation by a member community or social service agency. Homeless Connects provides opportunities for faith organizations to be of support to men and women residing in coldweather shelters.